The First World War has somehow been neglected by scale modellers until recently. This could be explained by a lack of quality armour model kits, but certainly not by a lack of interesting subjects. WWI vehicles have their own unique charm based on a different vision of warfare then we have nowadays. For example, the British Mark I-V tanks were initially developed for breaching German barbed wire entanglements and leading infantry into the trenches. Their designs were closer to the meaning of the word “tank” as well. However, the French FT-17 is closer to what we now recognize as tank – a tracked vehicle with hull and main armament mounted in a rotating turret. 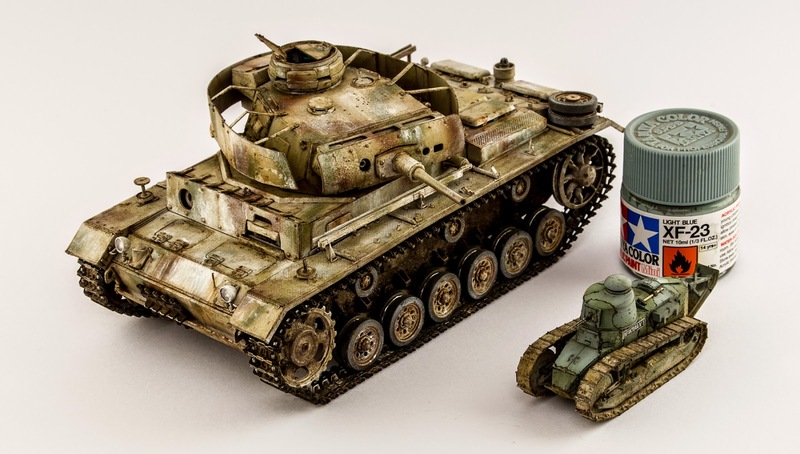 Last year we were treated to a massive release of FT-17 tank models in different scales – 1/35 from Meng, 1/16 from Takom and now Flyhawk has brought us a 1/72 scale offering. Clearly, this subject is now covered extensively. I had never heard about Flyhawk before and was excited to see what they are offering for armour modelling fans. The kit FH 3000 represents the French FT-17 light tank developed by Louis Renault, in this case the cast turret variant. Basically, it is similar to another Flyhawk kit FH 3001 (FT-17 with the riveted turret) previously reviewed on Armorama with the exception of new turret parts and a different drive sprocket. The FH 3000 kit is a 1-1 offering, meaning that it allows the building of 2 separate models. Packed into a cardboard box with box art on top the dark grey styrene parts are packed into several plastic zip lock bags. Additionally there are 2 photo-etched frets, a large decal sheet for 6 variants and colour assembly manual. After an initial look you get the impression that kit has a very high level of detail for 1/72 scale. So good in fact that it has better detail then some of the larger scale models as it captures all of the important elements of the original offering without them appearing oversized. The main hull has nice rivet detail, with some of the suspension components and tools moulded right on for ease of assembly. The hull comes in several parts, consisting of hull bottom, driver access doors, rear hull wall and engine access doors. The lower front of the hull is covered with a PE part that has some small rivets on it and they look a bit different than those on hull, however this might be difficult to note when the model is painted, weathered and installed on the base. The driver’s access doors have handles moulded shut and these can be replaced with the supplied photo-etched handles if desired. The sledgehammer head comes as a separate part, while the handle and clamps are moulded together with the hull. The left side of the hull carries the exhaust muffler and shovel, both crisply moulded. The right side has the tool box and some extra hangers. Here one can choose between photo-etched supports for the tool box or plastic parts. I used plastic for this review as I felt absolutely comfortable with their appearance. Additionally there are small photo-etched shackles for both the front and rear of the hull. The tail skid is made of 2 styrene parts and unfortunately there are 2 ejector pin marks on the inner surface that have to be sanded away carefully. I wish they could have moulded that part with pin marks on the outer surface as it would have been much easier to sand it there. The suspension is made of separate parts and Flyhawk has given us some options for different idler and sprocket wheels. The choice depends on the vehicle marking planned and they are clearly coded in the assembly manual. Idlers are either steel or wooden and drive sprockets are either with lightening holes or without. The road wheels and return rollers are moulded together with the bogies and the detail is rather sharp on them. The bogies could use some putty and sanding once finished as there is a seam line on top of the main bogie unit after joining the halves. The manufacturer’s logo comes as a PE part and should be placed on the external surface of the bogies. The tracks parts are handed so care should be taken to ensure they installed on the correct sides. After the suspension units are assembled they can be glued to the hull or left unglued for easier painting and weathering. The turret included in this kit is the cast type and unlike the riveted turret kit (FH 3001) it has a round shape. The turret comes with separate rear access doors and choice of armament – the 37mm Puteaux gun or 8mm Hotchkiss M1914 machine gun. Both weapons come as single piece and are inserted into the gun mount that is installed into the corresponding opening in the turret. The gun mount has an external frame that can be assembled from PE or styrene parts. The main turret has some mould seams that will have to be scraped off (seen on the image with 2 turrets – one has it removed and the other one was not cleaned yet). One of the painting options requires gluing the PE flag stand on the top of the turret. Flyhawk provides colour schemes and decals for 6 options with colour codes for Tamiya and Mr. Hobby paints. Unfortunately there is no information given on vehicle identification so one has to guess or search for reference images online. Only 1 variant utilizes the 8mm Hotchkiss, but there is a variation of steel and wooden idlers as well as different drive sprockets. The information provided below is what I was able to find online regarding the paint options. Scheme 3 is a 37 mm gun equipped tank from the French 1st Company, 505E RAS, WW1. Here the white numbers painted on the bogies are missing from the kit decals. Scheme 4 is an 8mm Hotchkiss equipped tank. I couldn’t find an ID for it, but it is most likely French army, WW1, judging from the “INFANTERIA #3” on the side of the hull. Schemes 5 and 6 are 37 mm gun equipped tanks, most likely WW1, French army. This is my first experience both with 1/72 scale and Flyhawk and this kit is very impressive. Clean sharp details, easy assembly, photo-etch parts included for better detail if desired (but not obligatory!) and several finishing options are the key points of this release. Definitely, this is a great offering for 1/72 scale modellers who would like to accompany their army of British Mark series tanks and enjoy the building of a model without stress. Highs: Great detail level, easy assembly, optional parts, two kits in the same box. Lows: No legend for painting and decal options, the photo-etched part on the front lower hull has rivets that appear differently from those on the hull. Hi, Jan The frame can be seen here - pic from Flyhawk webpage as for my model - I was too lazy to take SBS pics and painted it over 1 evening just need to work on it a bit more.